After another long, fun and challenging Southern Nevada Golf Association season, the 2018 Players of the Year have been recognized and revealed. There are first-time champs and others (hello Edward Fryatt and Frank Abbott) who continue to dominate their respective divisions (Championship, Silver). Another terrific 2019 is ahead of us, but now is the time to look back and honor our deserving players of the year. 2018 Players of the Year: Edward Fryatt, Championship (4-times in a row). Todd Roberts, Senior. Frank Abbott, Silver (5 times in a row). Jeffrey Gilliame, Net. “Dandy” Don Blanton, Senior Net. and Al Keuker, Silver Net. Also, the SNGA volunteer of the year was Sue May. For the WSNGA the co-volunteers of the year were Karen Herness and Rusty Beckel. The facility of the year was Bear’s Best Las Vegas and member club of the year was Chimera. See below for a list of accomplishments of each player and the recap video of these fine players. Plus, a Channel 8 sports feature about the SNGA and Senior POY Todd Roberts. Earned enough points to represent the SNGA in the Cobb-Whalen Cup against Northern Nevada. Competed in 21 SNGA and Nevada State Events. 18 in the Senior Division and 3 in the Net Division. That is the most events any player competed in in 2018. Don thank you for being such a big supporter of the SNGA and continuing to play in our events. Please join me in congratulating our 2018 Senior Net Player of the Year for the 2nd consecutive year, Don Blanton. Frank has been playing competitive golf for a long time now. During that time he has qualified for 11 USGA Championships with his best finish a Runner Up at the 2003 U.S. Senior Amateur. 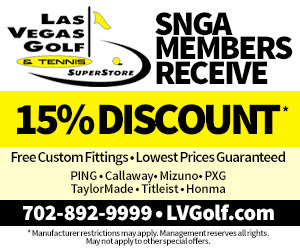 Since his first SNGA event in 2013 he has won more than 50 times, including 11 Majors, 3 Nevada State Silver State Titles, and the last 6 SNGA Championships. He competed in 19 events in 2018 which earned points towards the Silver Player of the Year. Out of those 19 events he finished in the top 5, 17 times. He finished Runner Up 7 times including in SNGA Tour Events at Wildhorse Golf Club, Aliante Golf Club, Las Vegas Golf Club, and Coyote Springs Golf Club. His Runner Up finishes in SNGA Championships include the 2018 Laughlin Amateur at Mojave Golf Club, The Henderson Amateur at Revere, and the Nye County Amateur at Mountain Falls Golf Club. Frank also accumulated 7 Victories in 2018. They include two SNGA Tour wins at Desert Pines Golf Course and Arroyo Golf Club. He also won at the 2018 Cascata Amateur Championship and right here in July at the Reflection Bay Amateur. He won 2 of the 4 SNGA Major Championships in 2018. Those wins came at the Southern Nevada Amateur at Legacy Golf Club, and the SNGA Championship at Cascata Golf Club where he won the title for the 6th year in a row. Al competed in 19 SNGA and Nevada State events that earned him Silver Player of the Year points. Out of those 19 events he finished in the top 5, 11 times. He recorded a T-3rd finish at our 3rd Major Championship of the year, the 2018 Clark County Amateur held at Boulder Creek Golf Club. His other victories include a 1st place finish at the Henderson Amateur at Revere Golf Club, and he took home the Silver Net title at the Summerlin Amateur held on both Highland Falls and Palm Valley Golf Clubs. 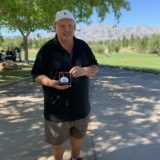 And while it did not earn him any Player of the Year points in the Silver Division, it is worth noting that Al finished Runner-Up in the Nevada State Net Amateur Championship against a field of 48 players. 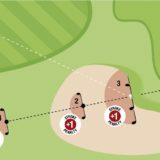 He won low medalist honors after 36-holes of stroke play, and then beat 2 match play opponents in the quarter and semi-finals before losing on the 18th hole of the Final Match. Beyond his accomplishments on the golf course this year I would also like to recognize him for his efforts in supporting and promoting Junior Golf in the area. He currently volunteers his time and sits on the Board of the Southern Nevada Junior Golf Association and is an integral part of their success. And lastly I would like to congratulate him for winning the honor of the 2018 Southern Nevada Golf Course Superintendents Association, Superintendent of the Year. Please join me in welcoming our 2018 Silver Net Player of the Year, winning this award for the first time, Al Kueker.